One of my favorite salads of all time is the Italian chopped salad. Whenever I go to any sort of Italian-ish restaurant or pizzeria, it’s my go-to order. And since I’ve had a lot of variations of the Italian chopped salad, I also have lots of opinions about it. 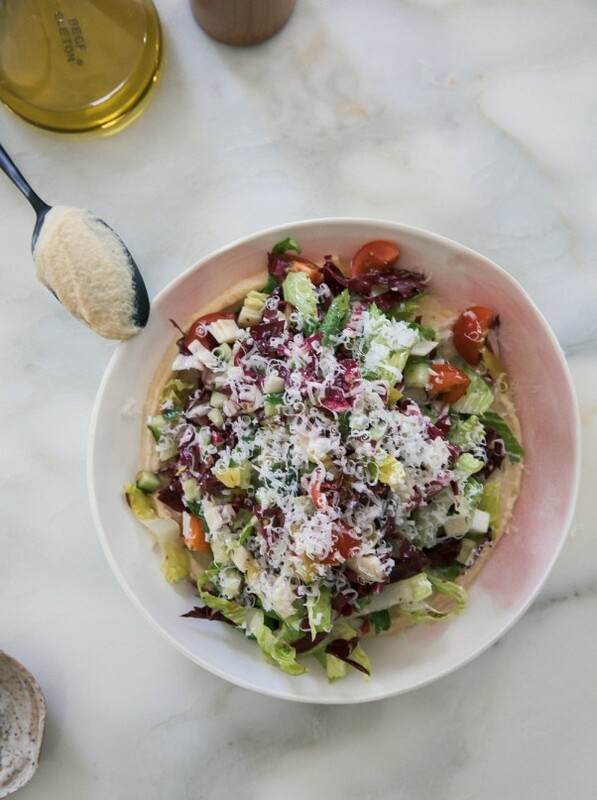 When it comes to Italian chopped salads, everything needs to be, well, chopped properly. Everything should be similar in terms of size. And the dressing! Lots of olive oil and oregano and red wine vinegar are key. But there are times when I’m craving a healthier salad, so here is a different iteration, a vegetarian option. Turns out, I love it without the salami and didn’t miss it one bit. One of my favorite Italian chopped salads is from Alimento in Los Angeles and they do this amazing thing by taking the garbanzo beans and pureeing them and placing them at the bottom of the salad plate. It is SO good. So I took inspiration from them and did it in this version and it’s just delightful. I hope you enjoy this vegetarian version. And of course, if you’re craving the meat, chop up a bit of salami and add it away! 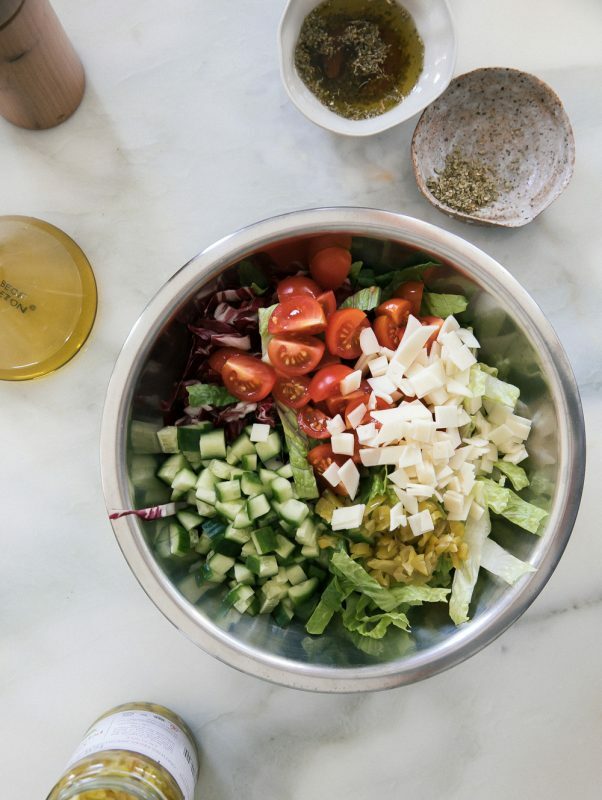 To Make the Dressing: To a small bowl mix the olive oil, red wine vinegar, dried oregano, black pepper and salt. salt and then add the oregano. Give it a taste and adjust the salt according to your liking. 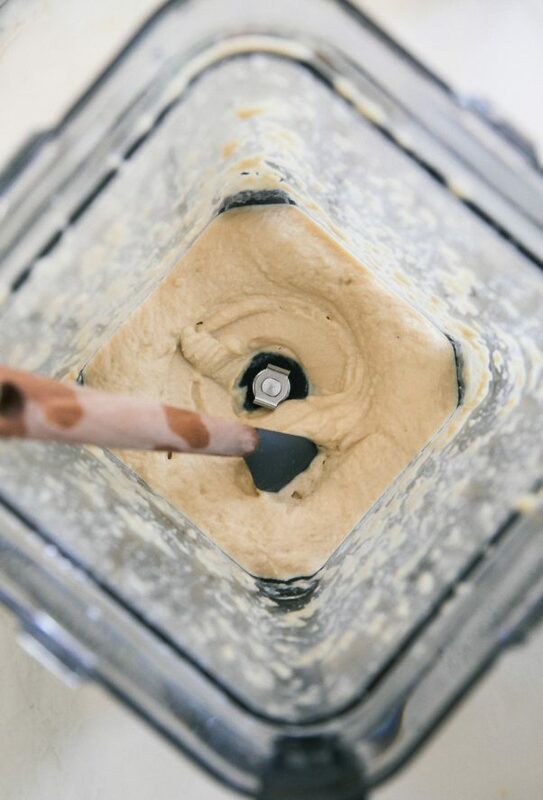 To Make the Pureed Garbanzo Beans: To a food processor or high-powered blender, add the garbanzo beans, along with the garlic clove, water, lemon juice and a few pinches of salt. Pulse until smooth, scraping down the sides as needed. Give it a taste and adjust the salt to your liking. 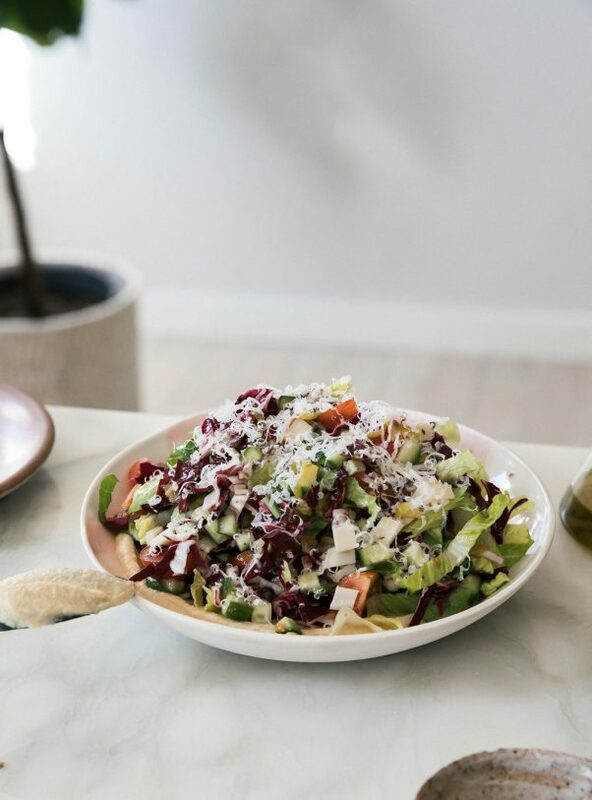 To Assemble the Salad: To assemble the salad, add the red onion, provolone, pepperoncini, cherry tomatoes, cucumbers, romaine lettuce and raddichio to a large bowl. Pour the dressing over the salad and toss until thoroughly combined. To serve the salad, add the garbanzo puree to the bottom of a serving bowl. Smooth it out into one even layer. Add the salad mixture on top and serve. Top with a tablespoon or two of grated parmesan and a few turns of black pepper.